The Cowboys Blog is a sports blog focused on the Dallas Cowboys and happenings in the NFL which affect the team. The site was designed by BitTorrent UX Developer Robert Velasquez, and we share in writing/podcasting duties. After the first four games of the season, we’ve experienced the full thrill and crushing depression of the Romo-coaster (I wish I could take credit for coining such a terrible phrase, but it’s not mine). Where has that left us? Hopefully, you’re like me and you haven’t dwelled in either extreme. Hopefully, you’ve come down from anger/distress and you’re in a state of limbo where you’re waiting to form your opinion still of what Romo can do with the team this year. After all, our record is .500, Romo’s injury hasn’t slowed him down and the team gained some ground in the bye week with losses by the Eagles and Giants. The season is still young and the team is on the mend with Miles Austin returning to the lineup this week against the Patriots. In instances like this, I like to reflect. And I’m sure like a lot of you, it’s been hard to reflect on anything else but our star-crossed quarterback. I’ve been taking in as much of the criticism of him as I can so I can inform my opinion. Personally, I always err on the side of not throwing someone under the bus until they absolutely deserve it. Those numbers would be Tony Romo’s career completion percentage, passing yards, average yards per attempt (#4 all-time behind Otto Graham, Sid Luckman, and Norm Van Brocklin — all players of the 1950s), passing touchdowns, interceptions (pretty damn close to 2:1 ratio) and passer rating. Don’t you dare look at those numbers and say Tony Romo is a bad quarterback. Yes, stats do not win football games, but stats also prove Tony Romo has won football games — just not important ones… yet. I want to compare these statisics to Brett Favre to prove a point. Brett Favre not only retired with a lower completion percentage, his TD/INT ratio was atrocious compared to Tony’s and he had a lower passer rating by almost ten points. All of this was forgotten because two years out of his career, Brett Favre had a team around him that took him for a ride to two Super Bowls and a single ring. Never before, never again. 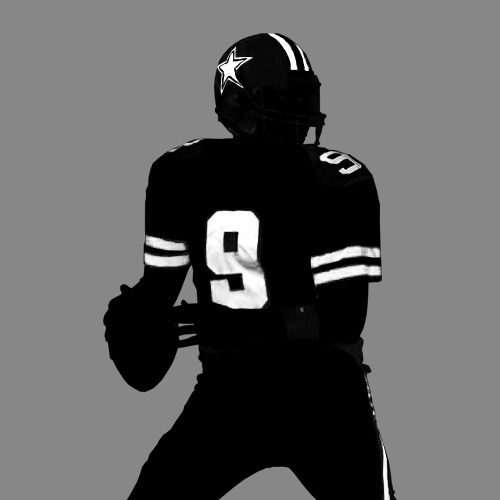 Tony Romo’s career trajectory as far as public opinion is concerned currently follows players like Favre and John Elway, who simply needed to happen upon a team that could shoulder some of the weight and make people forget their shortcomings and all the years people said they couldn’t win the big one. That’s the difference between Tony Romo and a pair of Hall of Fame quarterbacks. They faced the same criticisms as Tony Romo (especially Favre with his tendency toward turnovers)… until they just didn’t matter anymore because they got rings. Those two players played with the likes of Dorsey Levens, Terrell Davis, Antonio Freeman, Desmond Howard and Shannon Sharpe in those years. Who has Tony had? Other than Jason Witten who is more of a security blanket than a playmaker, Tony has only had T.O., who was never very clutch himself and… Terry Glenn? We’d also all be good to remember Tony has never had the “luxury” of a decent running game except for the year before Marion Barber decided he wasn’t going to run hard anymore. I like to remember things other people overlook or forget over time. I often think back to that botched field goal snap in Seattle, not because I hold something against Tony that could happen to anyone who’s ever dropped their cell phone, but because of what didn’t happen. On that play, if Martin Gramatica had become a football player for a split second and simply stepped in front of the only Seattle player on the field who had an angle on Romo, Tony would have EASILY run that ball into the endzone and won the game. That is to say, if the other ten Cowboys on the field had been firing on all cylinders like they should be, Romo would have single-handedly won that game and made up for his mistake. (Also, don’t forget he had led the team down the field into scoring position, and on third down had thrown a strike right at the sticks to Witten who stepped out of bounds short of the first down.) The botched snap play is a microcosm of Tony’s career. A disastrous game-losing play which could’ve easily been turned into a spectacular game-winning play if the rest of the team was playing on the same level. NFL analysts have been saying this is the year Romo needs to prove himself because he’s in his official 9th season, overlooking he never took a meaningful snap in his first 3 seasons, didn’t start all games of his 4th season (but led the team to the playoffs that year) and missed almost the entirety of last season. This is in reality his 4th full season. Cowboys fans who know damn well Romo’s unorthodox path to get here are also already calling for a new quarterback. A lot of those fans seem to think we could accomplish this through the draft. Really? First, you’d have to see how we finish this season before assuming we could get a decent enough pick to get a quarterback in the draft. Second, don’t forget the six seasons it took for us to find Tony Romo among the Drew Hensons and Clint Stoerners of the world. When you look at the offensive side of the ball for the Cowboys over the last five years or so, we’ve been blessed with two players who have anchored the team. 1. Jason Witten. 2. Tony Romo. Running backs have come and gone and never done anything solid. Other than the manic depressive tryst with Terrell Owens, wide receivers have been inconsistent until Miles Austin recently emerged. The offensive line has been a liability. How have we had any success at all? Tony Romo. So, you know… let’s just see how this season goes. OK? Let’s not call for Tony Romo’s head after regular season losses unless they affect our chances of making the playoffs. Tony has proven repeatedly he can get us to the playoffs, so he at least deserves a little faith there. And maybe this could be the year we’re given the opportunity to view him the way Green Bay used to herald Brett Favre despite his failings. It only takes one season, after all.